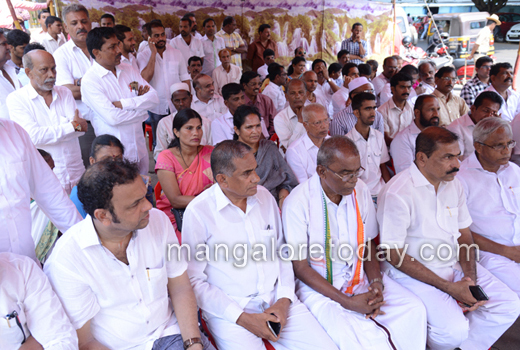 Mangaluru May 2, 2016: Congress Party staged a protest outside DC office on May 2 Monday against Union Government and Subramanian Swamy for the false allegation that Congress President Sonia Gandhi had received kickbacks in the Agusta Westland VVIP chopper deal. 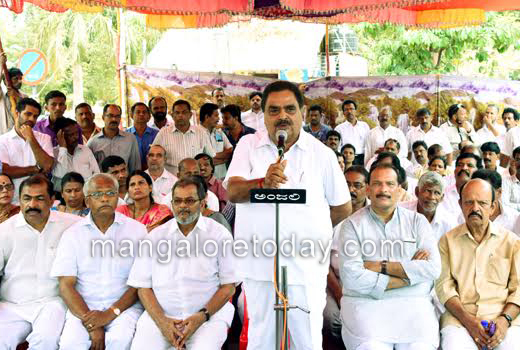 Addressing the protestors, District in-charge Minister Ramanath Rai alleged that Subramanian Swamy has falsely accused Congress President Sonia Gandhi of receiving kickbacks in the Agusta Westland VVIP chopper deal. The Congress is a party which played a dominant role in the Indian independence, he said adding the BJP government has utterly failed in living up to the expectations of the people. Ramanatha Rai said that Subramanian Swamy is a blackguard who is consistently passing comments against Nehru family and trying to defame the country. His contribution is nil so far, he alleged. Nehru implemented five year plan and introduced several schemes for the needy that should be remembered. Modi has failed to fulfil his promises so far, he added. 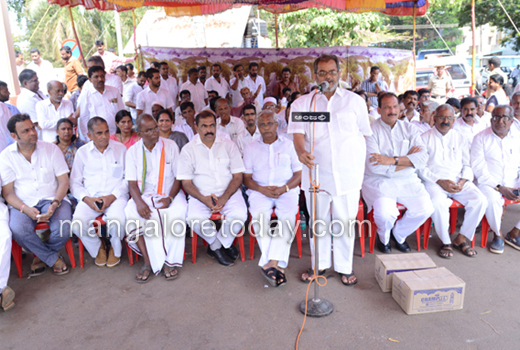 MLA JR Lobo said that it is unfortunate to have leaders like Subramanian Swamy who are a disgrace to the country. "BJP men are cowards who indirectly pass comments through Subramanian Swamy. BJP is known for its innumerous promises which are never kept after election," he said. MLC Ivan D’Souza said that "Subramanian Swamy is a traitor who is also BJP’s pet dog which barks for unwanted reasons and also needs to be exiled from the country." He was also critical of Defence Minister Manohar Parikkar for defending Subramanian Swamy by asking him to place facts along with the detailed chronology of the controversial Agusta Westland chopper deal and to prove that kick backs were received. 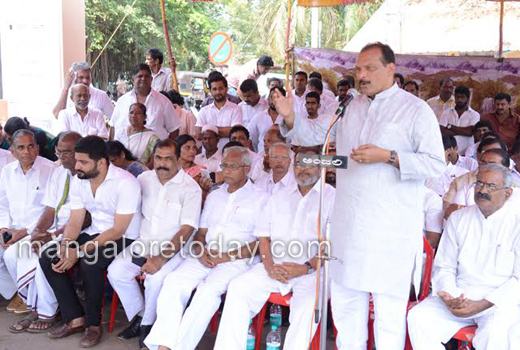 DK Congress interim President Ibrahim Kodijaal, MLA Mohiudeen Bava, Mayor Harinath, former mayors Mahabala Maarla, Ashraf, Shashidhar Hegde, Youth Congress President Mithun Rai, PV Mohan, AC Vinayraj and others were present.